Liverpool maintained the pressure in the race for Champions League qualification as Jordan Henderson’s fortunate second-half goal saw off Swansea at the Liberty Stadium to seal a 1-0 win. 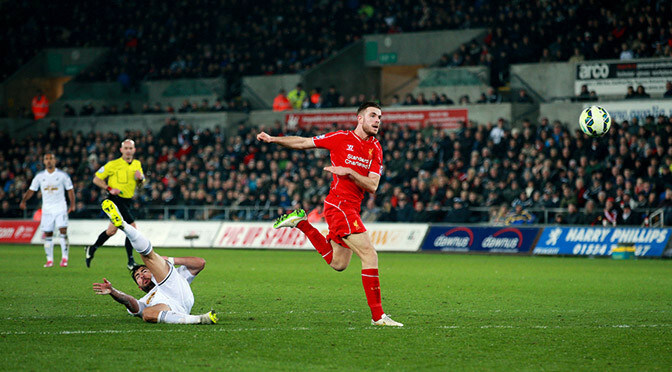 Henderson’s 68th-minute winner — his sixth goal of the season and his third in successive Premier League games — had a slice of good fortune about it as Jordi Amat’s attempted clearance clattered into him, but Liverpool will not worry about that on a night when Swansea had them clinging on for large parts of the first half. But Liverpool showed the resilience of a side which has not conceded away from home in the league since Dec. 14 and and grew in stature as the second half unfolded. The gap between themselves and fourth-placed Manchester United was cut to two points again before the pair meet in a huge Anfield collision on Sunday. After Arsenal and United both won over the weekend Liverpool knew they could not afford slipping up in south Wales and they were boosted by the return of skipper Steven Gerrard to the matchday squad after missing seven games with hamstring trouble. But Gerrard started on the bench as Rodgers kept faith with the midfield and attacking personnel which has had served him so well in recent weeks and underpinned the performances which have made Liverpool the form team of 2015. Joe Allen had shaken off a hip injury to feature against his former club and Martin Skrtel had recovered from the sickening fall which forced his withdrawal from Liverpool’s last game, the FA Cup quarterfinal tie against Blackburn eight days earlier. Bafetimbi Gomis had also been declared fit to lead the Swansea forward line after collapsing on the field at Tottenham on March 4, the result of a vasovagal condition which can lead to low blood pressure but one which apparently has no lasting effects. Liverpool’s need for the three points was greater than a Swansea side who had already reached the 40-point mark expected to guarantee another season of Premier League football, but it was the hosts who enjoyed the greater possession and scoring opportunities in an enthralling first half. Swansea were also slick on the break and Allen’s saving tackle prevented Gomis from profiting after rounding Emre Can before Skrtel took up the right position to clear Ki Sung-yueng’s header at the back post. Skrtel’s carbon-copy clearance soon denied Gomis as Swansea spotted a route to goal through Wayne Routledge’s forays down the right flank and crosses to the far post. Liverpool offered only fleeting moments of menace, most notably when Daniel Sturridge held off Amat for Adam Lallana to fire into Lukasz Fabiasnki’s midriff and the Polish goalkeeper comfortably plucking Philippe Coutinho’s 20-yard shot out of the air. But it was Swansea’s one-touch passing which was catching the eye and Ki found Gomis whose smart one-two with Routledge freed the Frenchman on goal. Gomis took the shot early, maybe too hastily, but it still forced a fine sprawling save from Simon Mignolet in the Liverpool goal. Mignolet made an even better save from Gylfi Sigurdsson’s curling effort and was then relieved to see Jonjo Shelvey’s strike from the resulting corner deflect to safety off Alberto Moreno. Rodgers must have demanded a major improvement from his side at the start of a second half which opened with Gomis arriving late after the action had started. And Liverpool immediately began to find their rhythm, if not the final ball, as Swansea were penned back in their own half for the first time in the match. Swansea were almost cut open after 58 minutes when Sturridge fed Raheem Sterling down the right and his cut-back found Coutinho who forced an excellent save from Fabianski at the base of his post. Gerrard was sent on after 64 minutes with Liverpool firmly in the ascendancy and he was soon celebrating a goal, even if it came in rather fortuitous fashion. Skrtel advanced from the back and his pass squirmed through off Sturridge before Amat’s attempted clearance cannoned off Henderson and over the helpless Fabianski. After that Liverpool pretty much held Swansea at arms length and Sturridge almost put the gloss on the win when he struck the post in injury time. Tottenham got their top-four tilt back on track by overcoming Swansea 3-2 on a night when Bafetimbi Gomis’ collapse had those inside White Hart Lane fearing the worst. As play was about to restart following Nacer Chadli’s wonderful, early opener, paramedics and medical staff raced onto the field to tend to the French striker after he went down. Hush fell on the ground where Bolton midfielder Fabrice Muamba suffered a cardiac arrest three years ago, but good news emanated from the Swansea dressing room that Gomis was fine and had not been hospitalised after feinting. Garry Monk’s side will have unlikely been aware of the positive news when Ki Sung-Yueng drew parity in a match which Spurs would go onto win, with second-half strikes from Ryan Mason and Andros Townsend securing the result after Gylfi Sigurdsson’s late strike. Defeat to Swansea would have seriously harmed their hopes of Champions League qualification, so Chadli’s fine, cushioned volley got Spurs off to the best possible start. That strike was quickly forgotten, though, when Gomis collapsed – an incident which saw him leave the field on a stretcher, but was thankfully not as serious as first feared. It was a worrying moment Swansea recovered well from, with Ki striking home from an acute angle soon after Sigurdsson sent a free-kick off the post. However, there was not to be a third straight Premier League win for Swansea, with academy graduates Mason and Townsend striking for Spurs in what was for the most part a comfortable second half. Sigurdsson’s late goal led to a nervy ending during which Hugo Lloris produced a wonderful save to ensure Spurs held on for victory – a fitting way to remember great Dave Mackay after he passed away on Monday. Spurs greats led a minute of applause before kick-off and the current squad wore black armbands in remembrance of one of the finest players to ever don the lillywhite shirt. None of the current side are a patch on Mackay but they got a win for him, opening the scoring inside seven minutes. Danny Rose found space on the left to send over a cross to Chadli, who showed wonderful skill and vision to hit an unorthodox cushioned volley past Lukasz Fabianski. It was a fine opener but it was quickly forgotten as the emotion from everyone inside White Hart Lane became one of concern as Gomis collapsed. The striker had four minutes of treatment before leaving the field on a stretcher – by this point conscious and wearing an oxygen mask. All corners of the ground applauded Gomis as he left to be replaced by Nelson Oliveira, with good news later filtering through that he would be fine. The first few minutes after the restart were understandably tense, with the volume only lifting when Townsend saw a low shot saved. 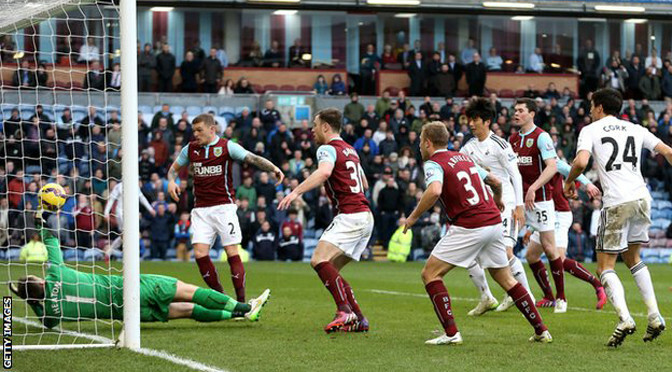 By this point Swansea appeared to have refocused and Sigurdsson hit a wonderful, curled free-kick off the post. It was a let-off Spurs failed to heed as Swansea worked the ball back in the box and Ki stole in to prod home from an acute angle after a Jan Vertonghen mis-kick. The 19th-minute leveller led to a more open, end-to-end encounter, with Mason hitting at Fabianski before former Spurs full-back Kyle Naughton fizzed a low strike wide at the other end. Swansea’s former Arsenal goalkeeper was proving a capable last line of defence for the visitors, getting a slight touch to take a clipped Christian Eriksen cross away from danger. A powerful Nabil Bentaleb drive was the next effort to test Fabianski, who was not to be beaten before half-time was called. Jonjo Shelvey saw an effort tipped over when play resumed before Ashley Williams’ tackle on Eriksen only put the ball into Mason’s path, with the midfielder lashing home with his right foot. The 23-year-old’s first Premier League goal swayed the match in Spurs’ favour, with Eriksen slicing an effort before Townsend broke at speed and cut onto his right foot, firing home when many expected him to square for Kane. Kyle Walker came close with an effort which deflected just wide as Spurs pushed for a fourth, with Eric Dier hauling back Oliveira on a rare Swansea attack. Substitute Roberto Soldado glanced a header inches wide, with the Spaniard inches away from directing home a Ben Davies cross – a missed opportunity which allowed Sigurdsson to reduce the deficit, volleying home a Jefferson Montero cross. The visitors pushed for an equaliser but, try as they might, there was not to be one, with Lloris tipping a Federico Fernandez header wide in stoppage time. 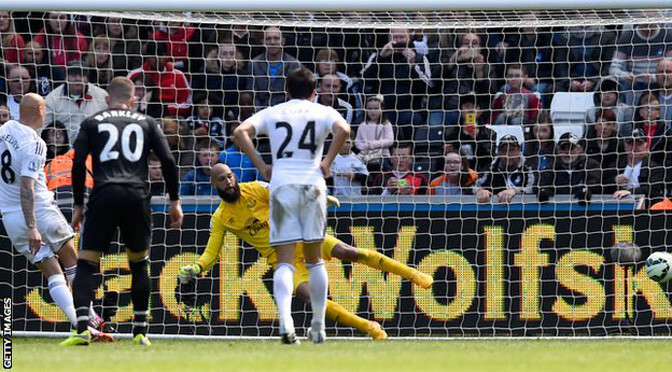 Swansea completed their first-ever league double over Manchester United to dent the Red Devils’ hopes of finishing in the Champions League places. The Welsh club had won 2-1 at Old Trafford on the opening day of the season but a repeat looked unlikely when Ander Herrera fired United into a 28th-minute lead. 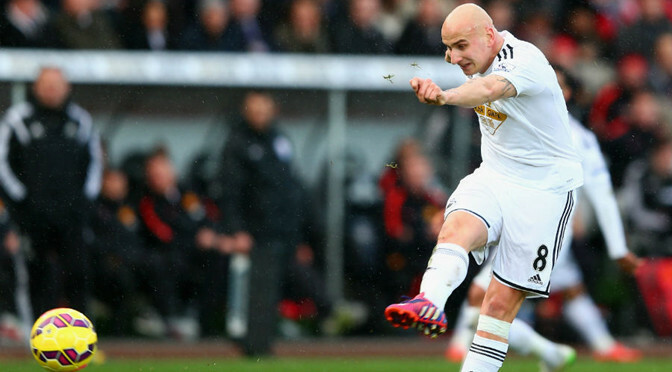 But Ki Sung-yueng equalised within two minutes and Jonjo Shelvey’s 73rd minute strike – which took a crucial deflection off team-mate Bafetimbi Gomis – gave Swansea only a second win in eight Barclays Premier League attempts as they prevailed 2-1. United manager Louis van Gaal had claimed his side were the best in the top flight on current form after losing only once in 19 games in all competitions but performances have rarely matched results and this will do little for their ambitions of finishing in the top four. Swansea started by changing their system with a diamond matching United’s as Wayne Rooney again operated up front for the visitors with Robin van Persie replacing the misfiring Radamel Falcao following the FA Cup victory at Preston. United were nearly the architects of their own downfall inside five minutes when Marcos Rojo’s poor pass set up Gylfi Sigurdsson’s blocked shot and a corner from which Swansea almost profited. Sigurdsson sent the ball in and Gomis lost his marker Paddy McNair to power a header which Herrera hacked off the line. Gomis put another header over after bar and Swansea were dangerous in attack but allowing Angel di Maria too much space to run into down the left flank. And when Di Maria’s corner evaded Lukasz Fabianski in the Swansea goal Van Persie collected at an acute angle to hammer a shot against the crossbar. A hugely enjoyable encounter was swinging from end to end and Gomis slipped Phil Jones to set up a shooting opportunity for Wayne Routledge which David de Gea safely gathered. But it was United who seized the lead when some fine approach play ended with Rooney finding Di Maria and the Argentina international set up Herrera’s fifth United goal, and his second in as many games, with a precise finish into the corner. 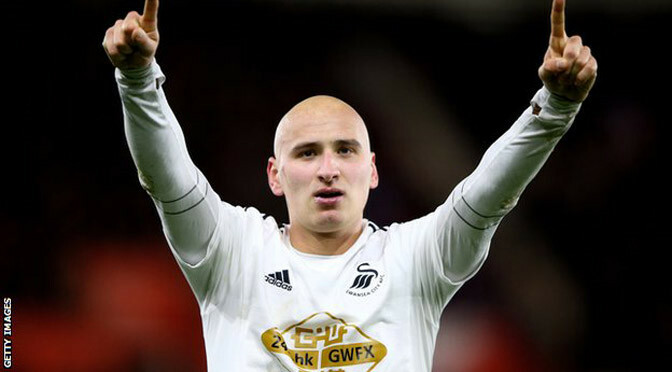 Swansea’s reply, however, was both emphatic and instant as Shelvey crossed from the left and Ki, just as he had done at Old Trafford in August, scored by getting across Luke Shaw and sweeping the ball home. Ki went close to a second soon after half-time when he timed his run superbly onto another Shelvey cross and de Gea spread himself well to make the save. Van Gaal’s response to try and achieve dominance was to put on fresh legs at full-back, Ashley Young replacing Shaw after Antonio Valencia had been introduced at half-time for McNair. United were enjoying the majority of possession with van Persie adding to a couple of wayward first-half efforts by smashing into the side netting on his more favoured left foot. Rojo headed over a Di Maria corner and United were firmly in the ascendancy when Rooney lifted a ball over the top of the Swansea defence but Van Persie was only able to scuff his shot under pressure. Swansea were clinging on but they relieved the pressure and struck against the run of play after 73 minutes when Shelvey’s powerful strike beat de Gea with the aid of a deflection off Gomis. The Frenchman brought another save from de Gea in the final exchanges as United ran out of ideas and were unable to pull off a late rescue act. West Brom moved four points clear of the Premier League relegation zone as goals from Brown Ideye and Saido Berahino secured victory over Swansea. Ideye, who was close to joining Qatari club Al Gharafa on transfer deadline day, opened the scoring with a low shot – his second goal in two games. He then turned provider, cutting the ball back for strike partner Berahino to slot home from 12 yards. 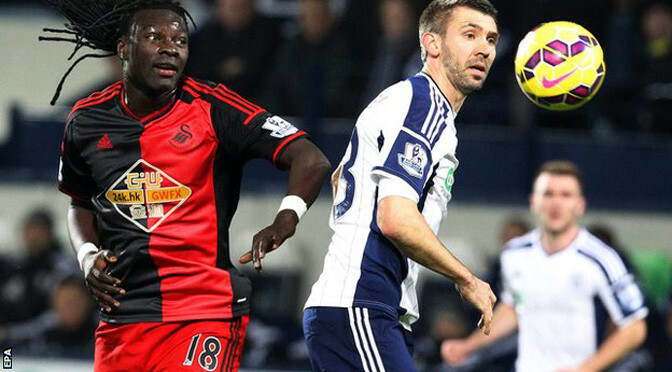 The result moves the Baggies up to 14th, while Swansea remain ninth. West Brom made three changes to the side that fought back from two goals down to secure a 2-2 draw at Burnley on Sunday. The introduction of top scorer Berahino and club record-signing Ideye from the bench was key to that turnaround and manager Tony Pulis opted to start with the strike duo at The Hawthorns. Ideye has struggled since making a £10m move from Dinamo Kiev last summer, but he showed signs his partnership with Berahino could blossom when the duo cleverly combined to earn a corner and provide the Baggies with the first chance of the game. Both of West Brom’s goals against Burnley had also come from corners but on this occasion goalkeeper Lukasz Fabianski was equal to Craig Dawson’s near-post flicked header and palmed away Albion’s best chance of the first half. Swansea’s best threat came from hard-working lone striker Bafetimbi Gomis, who fired a difficult chance at the near post over the bar before providing Garry Monk’s ponderous side with their first shot on target in the 40th minute – a volley straight at home keeper Ben Foster. Gomis, who had spent much of the campaign as second choice to Wilfried Bony, has failed to find the net in six starts since the Ivorian’s £28m move to Manchester City last month. And while Swansea continued failed to trouble Foster after the break, West Brom’s new strike pairing of Ideye and Berahino continued to threaten. First, Berahino played in Nigerian Ideye, who swivelled on the ball and fired into the corner to open the scoring on 60 minutes. Ideye then set up his strike partner 14 minutes later to secure all three points for West Brom, who have now lost just once in seven matches since Pulis’ appointment on 1 January. With time running out for Swansea, Gomis squandered a further chance to end his goal drought when he headed over from the penalty spot. The 29-year-old has not scored since January’s FA Cup victory at Tranmere, while his only Premier League goal came in November’s victory against Arsenal. 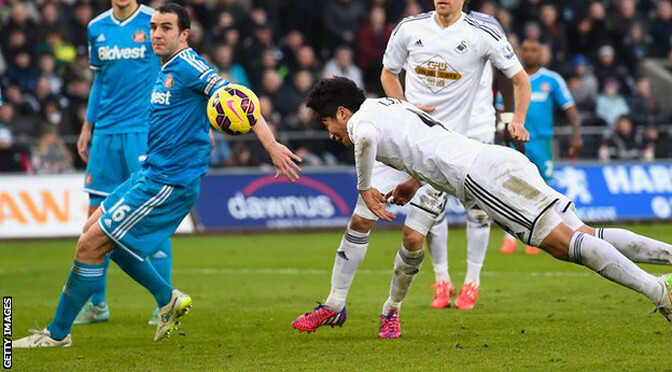 Sunderland claimed a valuable point in their bid for Premier League survival as they held Swansea to a draw. The Swans dominated the first half but their profligate finishing was punished as Jermain Defoe’s low effort put Sunderland in front. Ki Sung-Yueng equalised with a diving header against his former club, but Swansea were frustrated as they sought a late winner. Swansea remain ninth in the table, while Sunderland are still 14th. Having beaten Burnley last weekend to end a winless run of five games, Sunderland had hopes of claiming back-to-back victories for the first time this season after Defoe gave them the lead. But having withstood long periods of Swansea pressure, Gus Poyet’s side may have been content with a league-high 12th draw of the campaign. The Swans gave a debut to Jack Cork, a January signing from Southampton who was joined in midfield by Ki on his return from the Asian Cup with South Korea. With Sunderland striker Connor Wickham out injured, Poyet sprang something of a surprise as he handed former Swansea player Danny Graham a first Sunderland start since May 2013. It was another ex-Swan, however, who had Sunderland’s first chance, as Jordi Gomez fired wide with a well-struck shot from the edge of the area. That chance midway through the first half seemed to spark the match into life, as Swansea had a flurry of opportunities. A flowing move involving crisp interplay between Neil Taylor, Nathan Dyer and Jonjo Shelvey ended with a close-range effort from Bafetimbi Gomis smothered by Costel Pantilimon. Shelvey then had two long-range shots saved and a free-kick of his appeared to have created the opening goal for Swansea, but Ki’s sharp finish was disallowed for offside. The hosts’ despair was compounded seconds later, as Defoe put Sunderland ahead against the run of play with a drilled shot into the bottom corner shortly before half-time. Swansea continued to control possession after the restart, and their perseverance eventually paid dividends as Ki met Kyle Naughton’s inviting cross with a fine diving header. Garry Monk’s men pressed for a winner, as Shelvey went close with a curling free-kick from 25 yards and substitute Nelson Oliveira had a low shot saved by Pantilimon. But Sunderland resisted to claim a potentially precious point in their attempt to steer clear of relegation. Rudy Gestede showed why he is reported to be interesting a number of Premier League sides with the crucial goal as Blackburn sent nine-man Swansea tumbling out of the FA Cup in the fourth round. Kyle Bartley was sent off in only the seventh minute for a denying a clear goalscoring opportunity but Gylfi Sigurdsson put the 10 men ahead in the 21st minute with a glorious strike. However, Rovers levelled two minutes later through Chris Taylor and substitute Gestede, formerly of Cardiff, put the hosts ahead with 12 minutes left. There were fewer than 6,000 fans at Ewood Park but they went home happy after Craig Conway made it 3-1 in the 89th minute. And there was still a sting in the tail to come for Swansea as Sigurdsson showed his frustration with a reckless lunge at Taylor to become the second visiting player sent off. Both teams made changes, with Swansea boss Garry Monks naming only six of the same side that were hammered by Chelsea last weekend and leaving new signing Kyle Naughton on the bench. The Blackburn side featured six changes and their fans may have wondered where the goals were going to come from with Gestede and Jordan Rhodes only among the substitutes. But Josh King set about ensuring the pair were not missed early on and his pace was crucial in Bartley seeing red. The defender looked favourite to get to a long ball from Matt Kilgallon but he hesitated and an arm hooked over King’s shoulder as he burst through on the edge of the box was enough to persuade Craig Pawson to send him off. Tom Cairney’s free-kick had Lukasz Fabianski in trouble as he pushed the ball back into the middle and was fortunate that King screwed his shot wide when he should have scored. Monk responded by taking off the unlucky Tom Carroll and sending on defender Federico Fernandez. Swansea’s defence were really struggling to cope with King and he beat them for pace again with a break down the right before slipping at the crucial moment. The ball found its way to Cairney 25 yards out and his shot was heading for the top corner before Fabianski intervened. The pitch was hard and bobbly but Sigurdsson took the tricky surface out of the equation by blasting a shot into the top corner for the opener. The midfielder picked up the ball on the left and drove into the middle before letting fly past a helpless Simon Eastwood from 30 yards out. Two minutes was all it took for Rovers to equalise, though, and it was a fine move that ended with Taylor hooking in. The hosts switched play from right to left and good interplay sent Markus Olsson scampering away. 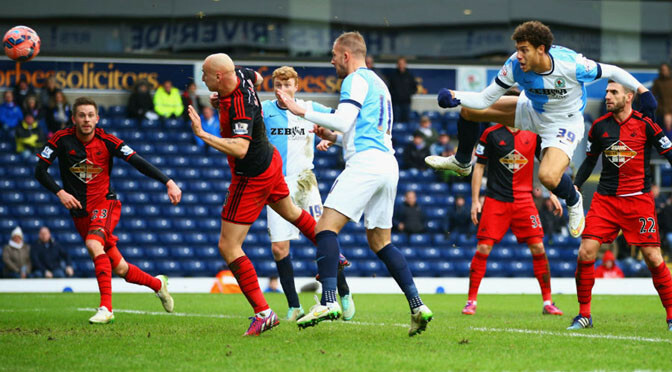 His cross was headed down by Cairney and Taylor showed great control on his chest before finishing smartly. Bafetimbi Gomis had been ineffective in the first half but he set up a shooting chance in the opening moments of the second before being foiled by a good block by Shane Duffy. With an hour gone, Bowyer sent on top scorer Gestede, who was left out entirely last weekend following reports of a bid from Crystal Palace, and in the 77th minute Rhodes entered the fray. A minute later Blackburn were ahead. The cross came in after the hosts played a corner short and, although Gestede did not make good connection with his initial header, he reacted well to volley in. Rovers still needed Duffy to make another superb block to preserve their lead, the defender denying Angel Rangel when he looked to be clean through, while Nelson Oliveira shot straight at Eastwood. But the result was put beyond doubt with a minute of normal time left as Conway’s shot found its way under Fabianski, and two minutes into added time Sigurdsson became the eighth Swansea player to be shown a red card this season.